A thoughtful look at the culture, life and events of the Hungarian nation from the point of view of a foreigner who has been living here in the capital for a decade. The recent elections in Hungary were the most divisive since the advent of democracy in 1990. For the first time, people were beating each other in the streets over political issues. Both side pumped up the debate sharply--through their negative ads, through their whispering campaigns. This was a crucial juncture in Hungarian politics, because the winner of these elections will lead Hungary into the European Union. At no point has any government since the end of communism survived more than a single term. Both sides seemed to whiff the chance at a double term and place in history--that the wave of happiness at EU admission will sweep the 2002 winner into a second four years come 2006. Families had rows and swore never to see their relatives again. Able-bodied young men got into shouting matches with little old ladies in the street. Feelings ran really high on both sides. Victor Orban: Sometimes accused of headstrong tactics, for many he is all but synonymous with Fidesz. After this failure then, who will lead Fidesz into the future? Will he groom an heir apparent? Many felt that Fidesz indicated that supporters of the liberal opposition were disloyal or un-Hungarian. Indicators had been looking up after four years of center-right Fidesz government. Yet certain classes still felt the austerity pinch, and many Hungarians still view the National Health Service as an embarrassment. The opposition MSZP was not at all slow to use these themes in their campaigning. The Fidesz slogan, "The future has begun," must have rung hollow to those who didn't feel they had personally benefited from the improving economic figures. 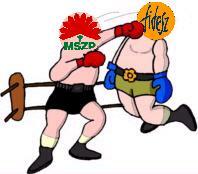 Campaigning became even more shrill after the center-left MSZP won the first round. It seemed demonstrators, flags and ribbons were everywhere. Peter Medgyessy: Many consider him the puppet of Laszlo Kovacs. Ironically, this highlights a strength of the MSZP, which can change faces and bounce back, banking on their "brand" name. Although the national psyche received a divisive shock that left many natives aghast, voter turnout in the second round was a whopping 75%. People were involved in the national debate. The end result was essentially in keeping with West European trends: a dominant liberal-socialist coalition squaring off against a well-defined, powerful center-right party. It wasn't exactly a landslide, however--the opposition edged Fidesz out by less than 1%. Perhaps owing partly to this small margin, each side strongly accuses the other of vote-buying. Tellingly, no extremist party, neither the right-wing MIEP nor the leftist Worker's Party, survived the first round. :) Compare this with the recent results in France, where Jean Marie LePen met defeat only in the run-off. Negative ads equated Orban with ultra-right-winger Istvan Csurka, the Hungarian saying "korpara megy" indicating he is a pig. It was hard for me to discern who funded the most negative of the ads. they have actually had relatively good government. In 1990, after the change of regime and the collapse of the Soviet trading block COMCON, the Hungarian economy plunged a staggering 25%! In the States, any negative growth, even one measly percent, causes upheaval. After four years of relatively rudderless government by the MDF (basically anti-Communist protesters), a term of rather more pointed stewardship under the MSZP (facelifted communists) /SZDSZ (liberal) coalition from 1994-1998, and four years of seemingly energetic government under Fidesz, Hungary now boasts a steady, modest growth rate, hundreds of miles of fiber-optic cable and a steady flow of (for better or worse) sparkling new shopping malls, bus terminals and university buildings, as well as the new bridge, National Theater and beltway. Hungarians never stop complaining, but every year they seem to be doing it from ever larger and more expensive cars.